Calum is the thrill-seeking lead singer of the Knights of Stone. While on a flight one night, he sees a dragon attacking a Pegasus who wandered too far from her herd, and jumps in to help. The Pegasus turns out to be a shifter named Arielle, and he decides that he must help her, no matter what. Their adventure finds them lost in another realm, wondering if they will ever make it home. It also finds them turning in to more than they thought that they would. Will Calum help her find her way home, or will he convince her to stay? It was a lot of fun to return to the Isle of Stone, and hang out with the Gargoyles again. This time a dragon and a Pegasus were added to the mix! The wonderful world building continued, with added realms. The character development also continued, adding more of Calum, and Arielle to the group. This turned out to be a lovely love story, but it definitely had enough action to keep me interested and entertained. I love that these stories are all a part of the same world and series, but each can stand alone with no problem. I jumped from book one to book five with no issue. This is a great addition to the series, and I’ll enjoy going back and catching up with the others! 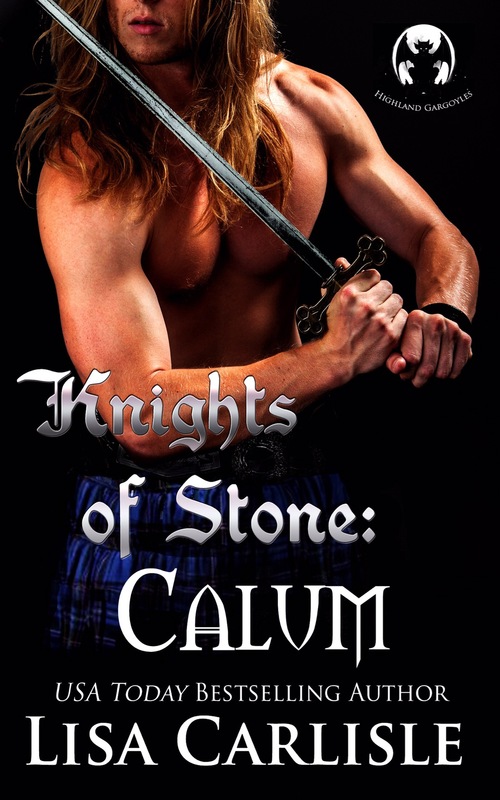 Knights of Stone: Calum Release!! The Gargoyle Shifters are back, people, and this time Lisa Carlisle brought us Pegasi!!! Calum lives for thrills both on and off stage as lead singer of the Knights of Stone. During a night flight, he witnesses a dragon chasing a pegasus and his gargoyle instincts kick in. When the rescued pegasus turns out to be a beautiful shifter named Arielle, he sets off on a dangerous mission to help her. Arielle never should have wandered from her pegasi herd. Not only did she attract the attention of a dragon who wants to steal her magic, but they’ve ended up lost in another realm. If she even makes it through the night, how will she ever return home? Calum and Arielle’s chance encounter in the Scottish Highlands turns into something more. Can Calum help Arielle return to her realm, when he wants to convince her to stay? For a hot Highland shifter series set on a mystical isle shared by gargoyles, tree witches, and wolf shifters, meet the brothers in the Knights of Stone today!